… And Should You Bother With It? A fast-growing body of research is finding that telomere length in leukocytes, the white blood cells of the immune system, reliably predicts age-related disease — and can be affected by genetics, chronic stress and health behaviors, such as exercise and diet. A tiny percentage of the cells in your body are immortal and can divide again and again with no limit. These immortal cells are largely a part of your immune system and fight off diseases and infections as well as repair injuries. Immortal cells also have telomeres that split into two, but an enzyme called telomerase restores the telomeres to their full size after cell division. For some reason the mortal cells in our bodies do not allow telomerase inside. Only the immortal cells do so. While immune cells are essential for our survival, another category of immortal cells are very deadly, and these are cancer cells. When cancer starts to grow in a person’s body, the immune cells are dispatched to the area, recognize cancer as not belonging there, and try to do away with it. The immune cells bring telomerase to the location where the cancer is growing to clone themselves onsite. However telomerase also fuels the growth of the cancer. Cancer cells need telomerase to clone themselves and cannot do so without it. One really intriguing possibility presents itself: Can we cure cancer by denying telomerase to the portion of the body where the cancer is growing? Well, such a medicine has been developed, and right now there are four clinical trials taking place with human cancer patients to test its effectiveness. (3) not cause serious side effects like heart attack or stroke. If successful, the cancer cells would not be able to clone themselves and multiply. The existing cancer cells would become senescent and die. Since 90 percent of all cancer cells are rapidly growing and need telomerase, the medicine has potential to take out all of these cancers at once. Time will tell if these studies are successful. Researchers collected human senescent cells that are incapable of dividing. Telomerase was force-fed to the cells in a test-tube study. What happened? The senescent cells had their biological clocks reset to zero and started dividing again, just like baby cells. In one case they divided 26 times before the experiment came to an end. Importantly, none of the cells in the experiment showed any cancer or tumor growth. This is great news, as scientists had previously speculated that the reason the body does not allow telomerase inside 99 percent of its cells — with the exception of immune cells and some cells that develop during pregnancy — is to prevent healthy cells from becoming cancerous. Molecular biologist Elizabeth Blackburn shared a Nobel Prize for her research on telomeres—structures at the tips of chromosomes that play a key role in cellular aging. 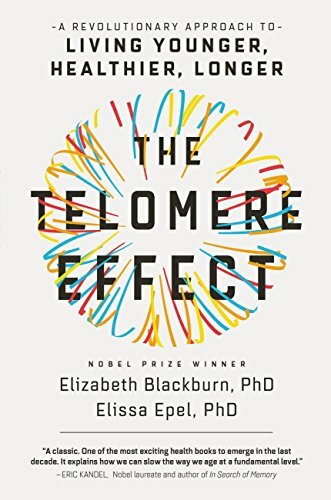 The main message of her breakthrough book, “The Telomere Effect,” is that you have more control over your own aging than you may imagine. You can actually lengthen your telomeres—and perhaps your life—by following sound health advice, the authors argue, based on a review of thousands of studies. Should we all just sit around and wait for more scientific telomere discoveries to happen? That would be a great mistake, because we already know of four sets of factors that each correlate with longevity, reducing the risk of cardiovascular disease, cancer, diabetes, and dementia (as well as many other deadly conditions). There is a proven correlation between telomere length and these four factors. For example, one study found that runners have been found to have longer telomeres than sedentary people. The bottom line is that if you take great care of your body, cell division is postponed, just as research also shows that if you take lousy care of your body and the cells are under stress, they will divide more quickly, shortening your telomeres. Doing the right things with these four factors will not make you immortal, but it may be the difference between dying in your 90s and dying in your 60s. I hope this article provided some practical, empowering information. Are Genetic Testing Services Worthwhile?